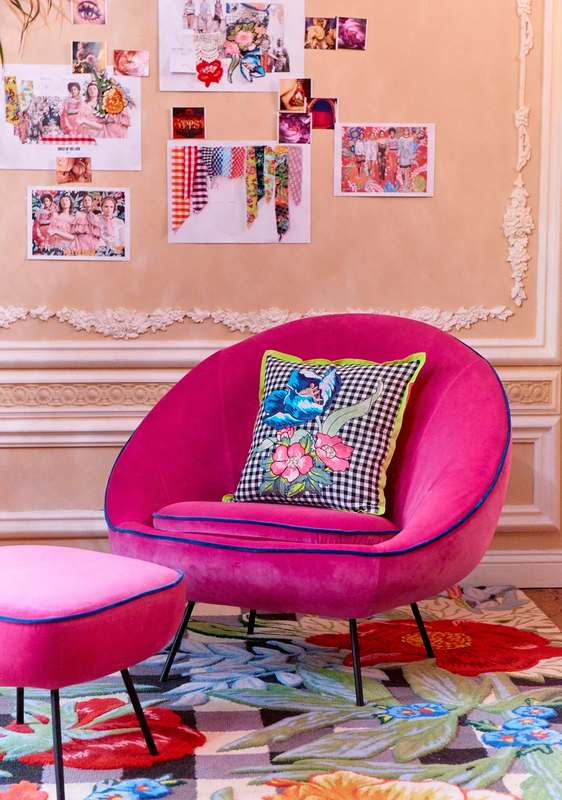 The arrival of Spring in the UK also heralds the launch of fashion designer Henry Holland’s second homes collection for Brit interiors brand Habitat: House of Holland x Habitat. Taking cues from House of Holland's SS17 catwalk collection 'Free To Roam' and the Romany travelling community, it's a riot of colour and clashing patterns, mixing giant florals with gingham checks and hot pinks with acid greens. Key pieces are the ‘Misty’ armchair and footstool in shocking Schiaparelli pink velvet with bright blue trim, the 3D handcarved ‘Folklore’ rug and the reversible ‘Boho’ bedding set (cute florals on one side and slashed up checks and gingham on the other). Accompanied by embroidered slogan cushions and a lime green mesh throw, Holland's collection is bold and brazen and very now. If you’re hanging out at London's hipster hotel The Hoxton in Holborn you can even ‘try before you buy’. The #henryforhabitat collection has been given a suite throughout March, showcasing artwork and furnishings from the new range. It’s available to book for a limited period for £199 per night but you can also win a night’s stay plus dinner for you and a guest by entering Habitat’s ‘Find Peggy’ competition. All you have to do is spot where Holland’s pet pooch is hiding in the suite. To enter the competition click HERE.